Suzhou is famous throughout China for its classical gardens. In fact, a famous Mandarin quote goes 上有天堂，下有苏杭 or shang you tiantang, xia you suhang, which means "in heaven there is paradise, on earth there is Su[zhou] and Hang[zhou]. Suzhou residents were historically very wealthy because of the thriving silk industry in the region and many of these rich families had enormous compounds that included fantastic classical gardens. Many have been preserved and are now open to the public. In fact, nine of the gardens are part of the UNESCO World Heritage Cultural Site list. 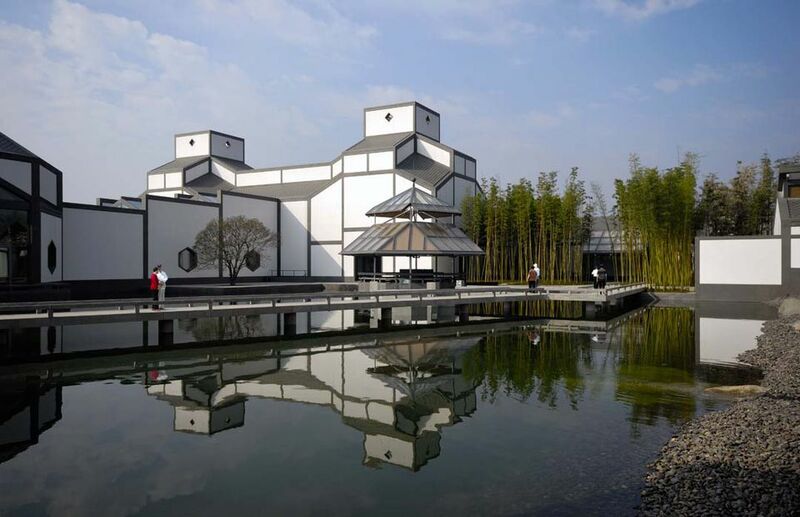 The Suzhou Museum: One of the best museums in China and architecturally stunning, this museum was designed by Suzhou native, I.M.Pei. Visit this museum for its small but interesting collection of Chinese cultural artifacts. Temples: One of the most picturesque temples is Tiger Hill, which is especially beautiful in the late fall when the gingko trees are bright yellow. Visit Tongli: The famous water village site just a few miles outside of Suzhou and offers a glimpse into what ancient life was like on the lakes of the region. Walk Suzhou's Moat-ring Trail: Opened in 2016, this 15.5 kilometer trail follows Suzhou's moat past the city's impressive bridge gates and gardens. Outside of Suzhou's Old Town, the massive Jinji Lake is surrounded by towering hotel chains. While these international outposts might not seem like the best way to immerse yourself in the local culture, Western comforts can make all the difference in getting a good night's rest after a long day of exploring the city. The Intercontinental Suzhou offers spacious, beautifully designed rooms and an impressive buffet breakfast with both Chinese and Western delicacies, while the W Suzhou welcomes the city's most stylish to its rooftop and lobby cocktail bars, renowned modern Chinese restaurant and chic and contemporary guest rooms. For the ultimate in bachelor style, consider the Tonino Lamborghini Hotel Suzhou. Owned by a member of the actual Lamborghini family, this expansive retreat offers sleek design, lake views and long corridors lined with carpets emblazoned with Beatles lyrics. It's less geared towards the Western traveler, but it's certainly one-of-a-kind. Suzhou is located on the Yangtze River Delta in Jiangsu Province. Shanghai lies just 1.5 hours (by car) to the east, Zhejiang Province is to the south and Taihu Lake is on Suzhou's west side. Most visitors go to Suzhou from Shanghai for the day. There are a number of ways to do this. Private car/taxi/tourist bus: Suzhou is just 1.5 hours away from Shanghai by expressway. Note: heavy traffic is often a problem so the train might be a more comfortable option. Train: There is a large number of trains traveling between Shanghai and Suzhou. The trip takes only 45 minutes. Boat: It is possible to go between Hangzhou and Suzhou on the Grand Canal. Aside from the usual subway, buses, taxis and canal boats, there are a number of pedicabs operating in Suzhou as well as the surrounding water towns. It's a great way to see the city from the level of a pedestrian, without the sore feet. Be sure to negotiate your fare before you get in and stick to your guns as they've been known to charge more once you arrive. Best to have the exact fare ready to hand him when you get off the cab.